ESOS is a new scheme, established by the Department for Energy and Climate Change, in response to the requirement for all Member States of the EU to implement Article 8 of the Energy Efficiency Directive. It is implemented in the UK by the Energy Savings Opportunity Scheme Regulations 2014. It is an energy assessment scheme that is mandatory for organisations in the UK that meet the definition of a ‘Large Undertaking’. Does my Organisation meet the definition of a Large Undertaking? What do I have to do if I qualify? If your organisation meets the criteria as at the Qualification Date of 31st December 2014 then you will have to comply with the Scheme requirements. To measure your total energy consumption. Including Buildings, Transport and Industrial operations use of fuel, electricity and gas. Ensure that at least 90% of that consumption is audited and analysed for energy-saving opportunities by an ESOS-approved method. Report your compliance to the Environment Agency. 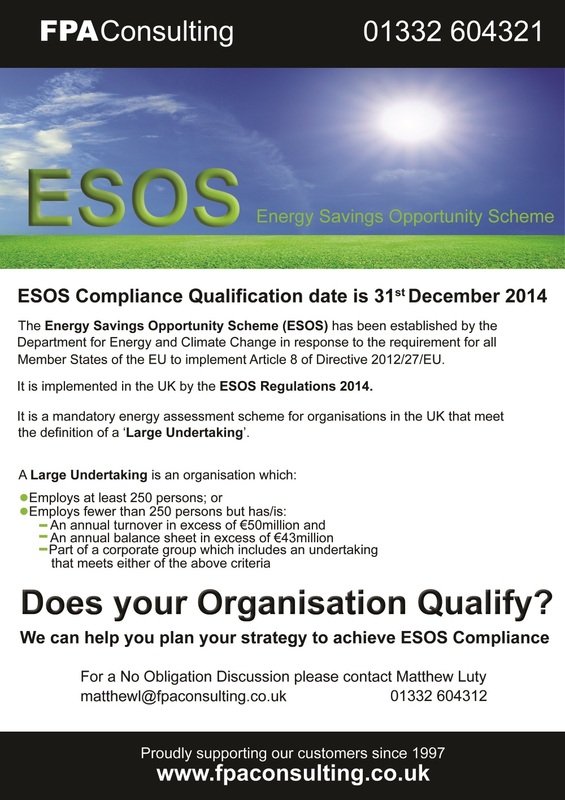 The ESOS Scheme runs in four-yearly cycles. For each there is a Qualification Date and then a period of Compliance culminating in a Deadline for Compliance. The first Qualification Date is 31st December 2014 with a Compliance Date of 5th December 2015. …is to decide if you will qualify as a Large Undertaking as at 31st December 2014. The detailed criteria can be found in this Guide issued by the DECC. Once this is established, we can help you plan your strategy for compliance.